This time last year Mike was stacking wood and shoveling snow (I just read last year’s newsletter!) in a “blustery 18 degrees” and today he does the same in 9 degrees of blowing snow. I’m comfy in my fuzzy pink bathrobe by the fire, still determined to give the snail-mail authorities a little extra business this year. Our family continues to grow! Travel this past year included two weeks in California where I was honored to help my sister Christine and her children with my brother-in-law Keith’s transition from this world to the next, my trip to Smith College to speak on a panel at their Leadership Conference, a trip to sister Carol’s to visit with Mum and sister Charlene, an unexpected trip to Hilton Head to visit with author Janet Sheppard Kelleher (where I parasailed and avoided gators and dropped my phone in the ocean and put together my book Haikus Can Amuse—because I dropped my phone in the ocean), a week in Maine to visit with my Mum and family at Susie and Jim’s gorgeous waterfront home, a road trip to visit Jake in Austin and another couple of weeks in the trailer at Moab and Lake Powell with Mike and the Ranger-dog. I’m becoming quite the Stand-Up-Paddleboarder and absolutely love being on the water! There were also several Colorado road trips to attend various author events at schools and libraries. Pitch: Please support your local libraries! They do much to support their communities and their local authors. Summit Library’s Teen Reading Program director went all out for my visit with her group! I continue to write and publish my books on Amazon and blog at www.leadvillelaurel.com about lots of things including another no-kill hunting season and my first warm elk harvesting from an early morning roadkill call. We finally had a legitimate reason to purchase a separate freezer. Waterwight hit the streets on Leap Day. It was great fun to write, and now I’m working on Waterwight: Flux, the second book in the series. I have a feeling 2017 will be a year of great productivity as I have several other writing projects in various stages of completion already. Training for and competing in his 11th one-hundred-mile mountain bike race this summer just wasn’t exciting enough for Mike, and though it wasn’t his plan, he ended the race in time to manage one of many of the wildfires in Colorado last summer. After several exhausting days he returned to a structure fire, and as soon as he was convinced all was in control, I drove him to Denver to have his second hip replacement, but not before I sent him off to California to climb mountains with his brother Mark over Labor Day weekend. He had to make sure he used up every last bone surface and I had to get him out of the house to compete in a 3-Day Novel contest. By the way, he’s now quite happy being Titanium Man, and I wrote my best piece of fiction ever. Not sure what the county would do without his Emergency Manager expertise, and he’s pretty happy with his influence in many areas throughout our community. 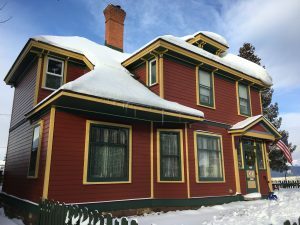 He humored me by letting me offer our home for Leadville’s Victorian Homes Tour right after Thanksgiving, for which I felt compelled to complete the installation of hardwood floors in several rooms. We had a toilet in our living room until the day before Thanksgiving and couldn’t really use the kitchen for the whole week prior, but that didn’t stop me from being able to feed an Army Thanksgiving afternoon. Have I mentioned what a great guy my husband is? As for our sons, Jake still enjoys life in Austin working in the IT world and still working on the van that broke down there over a year ago. My Mum made the difficult decision to stop driving last summer and sent her vehicle to him, much to his surprise and delight. He visited us this past summer and at Thanksgiving, but will stay in Austin to have a friends’ Christmas this year. I knew it had to happen at some point, and it will be most peculiar having our first Christmas without him home, but we’re happy he has good friends with whom to share the celebration. First Lieutenant Nicholas McHargue (Army National Guard promotion this past summer) continues to work at the mine while completing prerequisites for applications to medical schools. We still love having him live just a mile away, and I think he enjoys his mum’s home cooking every once in a while. The Ranger-dog is still a goofball and loves traveling with us. If you’re interested in knowing more about him, I wrote a blog post called “Don’t Get a Dog” which you might want to read before making a decision to get a dog. We really do like him. “Life is for the living. Death is for the dead. Each year I try to do better at treasuring the beauty of each new moment—even the painful ones—in my fleeting life. I wish the same for you. Merry Christmas and Happy Holidays, whichever ones you choose to celebrate. And may 2017 be a year filled with health, happiness, and unconditional love. Are you on my mid-monthly newsletter list? 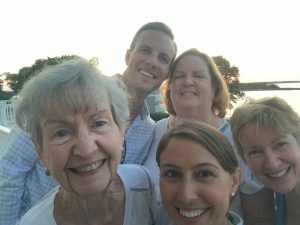 Here’s a sample from this month: January News! “Onions. Love them or hate them. Cartoon movie character Shrek tells his love that he has layers, like an onion. Layers of clothing on a poor woman who resorts to stealing something as simple as an onion—it’s enough to make me cry. Why an onion? Was it easier to steal than an apple? Perhaps she already had the apple. What would I do? Surely I would not report her. Could this be her only meal tonight? Theft makes everything more expensive for those who pay, so I could be righteously angry, but I’m not. I think of the onions I’ve let rot in my basket, onions I’ve thought nothing of tossing to the compost. What I could feed that poor woman with what I’ve wasted! 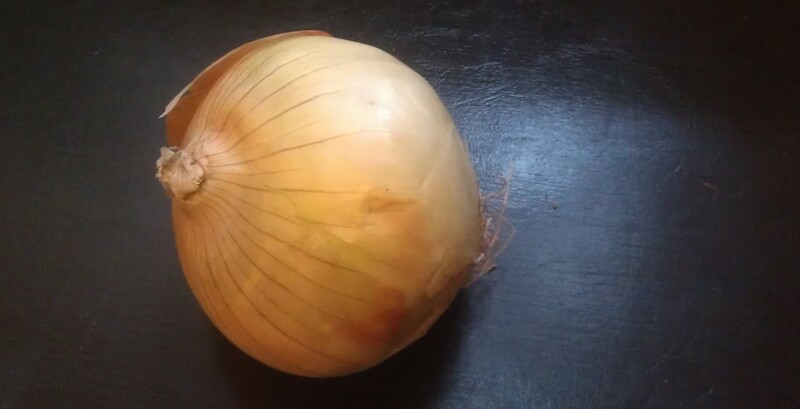 If you saw an old lady stealing an onion at an open market, what would you think?